Most web hosting providers have an option to host unlimited domain names and Dreamhost is one of them. To add an existing domain name to your Dreamhost account is very simple and below I will show you in 5 easy steps on how to do it yourself. Here you will enter in your new domain information. You will see a success message that you successfully added this domain to your Dreamhost account. All you need to do now is to add the nameservers to your Domain Name Registrar. In my case, Iwill need to add them to my Godaddy account. The nameservers are in the red box in the screenshot below. 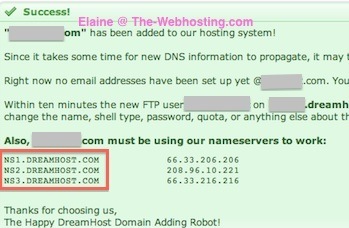 Click here to learn how to add Name Servers into your Domain Name Registrar.